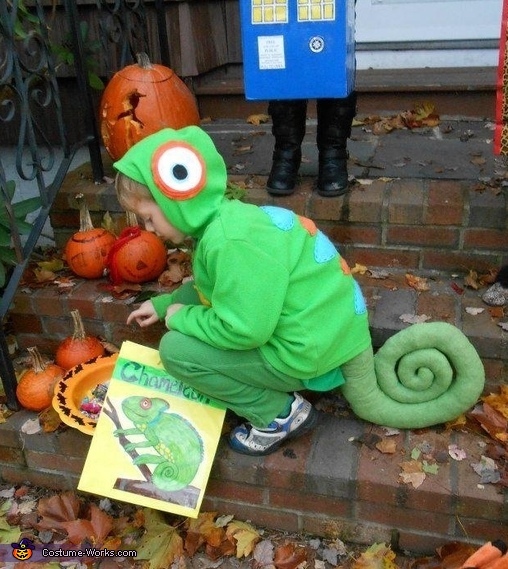 My son Zachary dressed as his favorite animal, a chameleon. It was made from old clothes, felt, and a green body pillow (the tail.) I also made his chameleon trick or treat bag. Where did you get the tail? I made the tail out myself and I don't think you'd want to buy it now. It's been in our dress up bin since last Halloween. I do not have step by step instructions. I used an old green hooded sweatshirt, sewed some felt stripes on the back and felt eyes to the hood. To make the tail I used a green pillowcase, cut it into the spiral shape and sewed it together, stuffed it with filling. I loved your post moominmamma! Is someone interested in making one for my 6 year old? I am willing to pay THANK YOU!